Saffron is one of the most expensive spices in the world! Learn how to use these beautiful red threads in your cooking and how to spot the fake stuff! 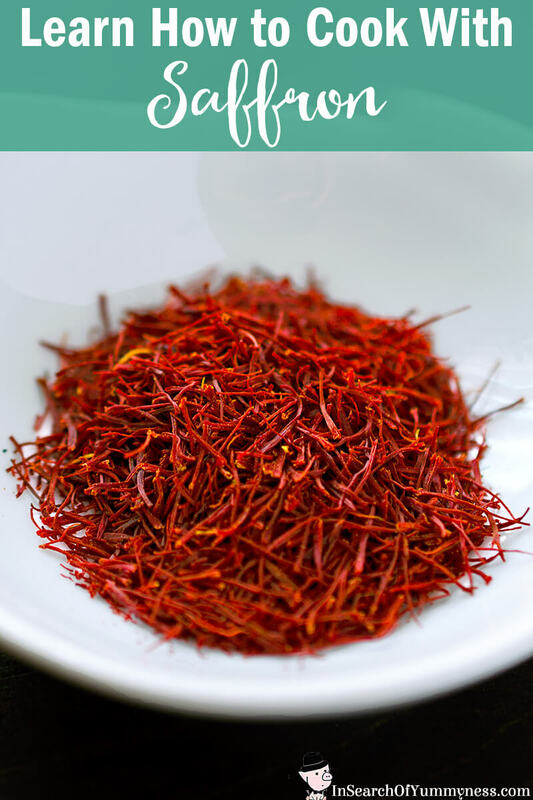 Saffron is the reddish-orange dried stigmas of the purple crocus flower. It has a complex scent and flavour that can be difficult to describe… The dried stigmas have a deep woody smell on their own, but they add a sweet earthy scent and flavour when added to food. Too much saffron can make a dish bitter though, so you generally only need to add a pinch to whatever you’re cooking. Which is a good thing, because this spice is very expensive! So as you can imagine, it takes thousands of stigmas to make just a small amount of saffron, and they all of to be painstakingly harvested by hand and then set out to dry either over charcoal, or under the sun. With that in mind, it’s no wonder that good quality threads can cost about $10 for just 1 gram! This is one spice you don’t want to waste. 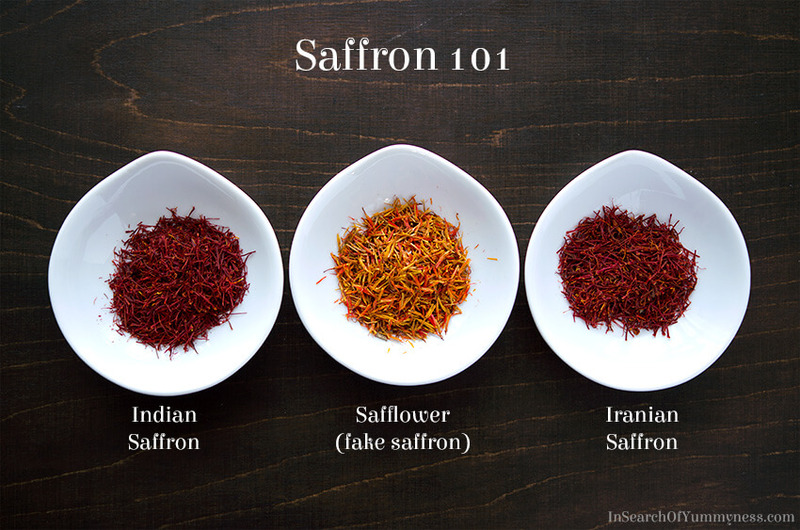 Speaking about quality – it’s important to know how to spot fake saffron. In the image above I’ve shown 3 different products that were all labelled as saffron. The first one and the last one are both good quality saffron – even though they were harvested in different regions. You can get good quality threads that are cultivated in Indian, Spain and Iran (although people will dispute that one is superior to another). However, take a look at that pile in the middle. Although the packaging is labelled as saffron, it is actually something completely different. These stigmas are from the safflower plant, and they are often used to imitate saffron in various ways. Although the stigmas smell a little bit like saffron, they don’t have the complex flavour of actual saffron. They also don’t colour food in the same way. Safflower stigmas are sometimes ground up and mixed with ground saffron to “stretch” the product. This is called adulterating saffron, and it’s one of the reasons why you shouldn’t buy pre-ground saffron. The other reason is that ground saffron doesn’t retain the same flavour as whole saffron threads, so really you should just avoid that stuff. Colour – good quality saffron has a dark red or reddish orange colour. Shape – you should be able to see individual threads. The package of safflower stigmas that I have has many large clumps that are still attached together. Price – there is no such thing as “cheap” saffron, so if the price seems too good to be true… it probably is! What Can I Make with Saffron? 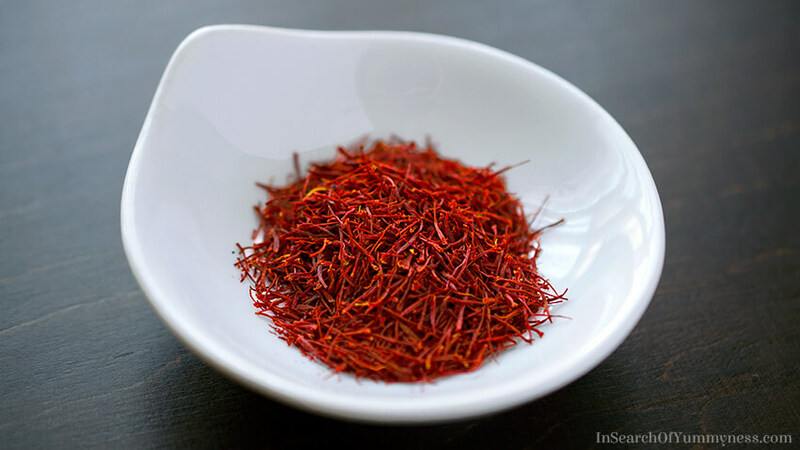 When you think of saffron, you might immediately think of it as an Indian spice. This isn’t inaccurate, since the spice has been cultivated in India for centuries. However, you might not know that saffron is also a popular spice in Mediterranean and Middle Eastern cuisine. When saffron is added to warm liquids, it releases it’s pretty yellow colour. You might recognize this colour in the classic Spanish rice dish called paella. It is also commonly used in Italian risotta alla Milanese, French bouillabaisse, Persian polow rice dishes and Yellow Chartreuse (a French liquer). You can add saffron threads to dishes whole, or grind them into a powder. Soak the threads in warm water or another liquid to soften, then add it with the liquid to whatever you’re cooking. You can try adding it to savoury foods like rice or chicken, or to desserts like custards or cakes. You can find small packages at most groceries, including Bulk Barn (it’s not sold in bulk though). You can also find saffron at speciality Indian, Caribbean, Iranian, Spanish and Mediterranean stores. If you prefer to shop online, you can buy it from TheSpiceTrader.ca, SpiceTrekkers.com, or SilkRoadSpices.ca. I haven’t shopped from these online stores before, but I know other Canadian bloggers who recommend them. Some of the best saffron is said to come from La Mancha and Kashmir, but you find good quality options from various regions in India, Spain and Iran. To keep this spice fresh, store in an airtight container in a cool dark place for up to 6 months. This post contains Amazon affiliate links, and I will be compensated if you make a purchase after clicking on my links. I’ve actually had really good luck finding great Saffron at Winners or Homesense! Thank you for the Saffron primer. Surprisingly I think mostly of Spanish food or Middle Eastern food mostly using Saffron, not Indian. I would like to know what Indian dishes have Saffron in them, do you have any? Oh that’s good to know!! It’s amazing what you can find at those stores! I’m working on an Iranian rice dish that has saffron right now (should be up later today or tomorrow), and off to the top of my head I’ve made an Indian dessert with saffron and vermicelli noodles called Seviyan. I’ll try to post that soon! I bought saffron from a reliable company in iran and with right price, iranian saffron is perfect.